Just a quick post today to keep the blog moving. 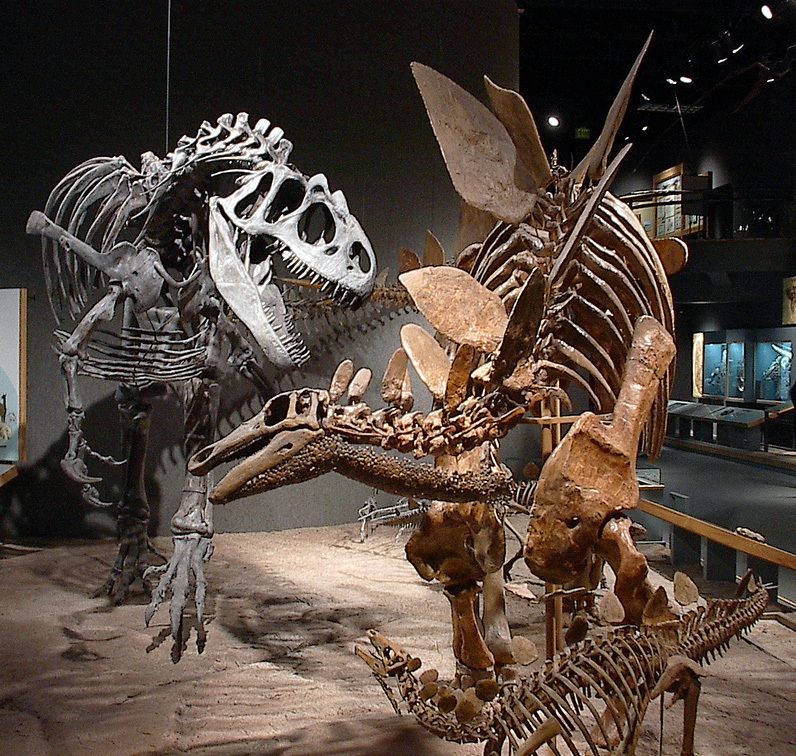 The Allosaurus and Stegosaurus skeletons at the Denver Museum of Nature and Science are among my all-time favorite fossil mounts. While there is no shortage of fighting dinosaur displays today, these mounts were something of a novelty when they were unveiled in 1995 as the centerpieces of the trendsetting “Prehistoric Journey” exhibition. A far cry from the stiff, macabre trophies that had dominated paleontology exhibits since the beginning of the 20th century, the Allosaurus and Stegosaurus plainly represent swift and active animals. Unlike many similar scenes, however, the action here is tempered with careful attention to anatomical detail: no limbs are hyperextended, and no bones are out of place. 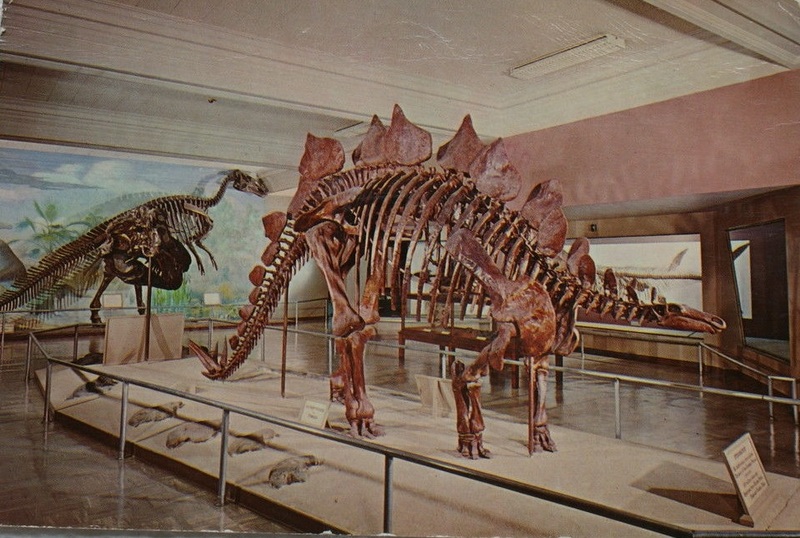 This postcard shows the original Stegosaurus mount around 1950. 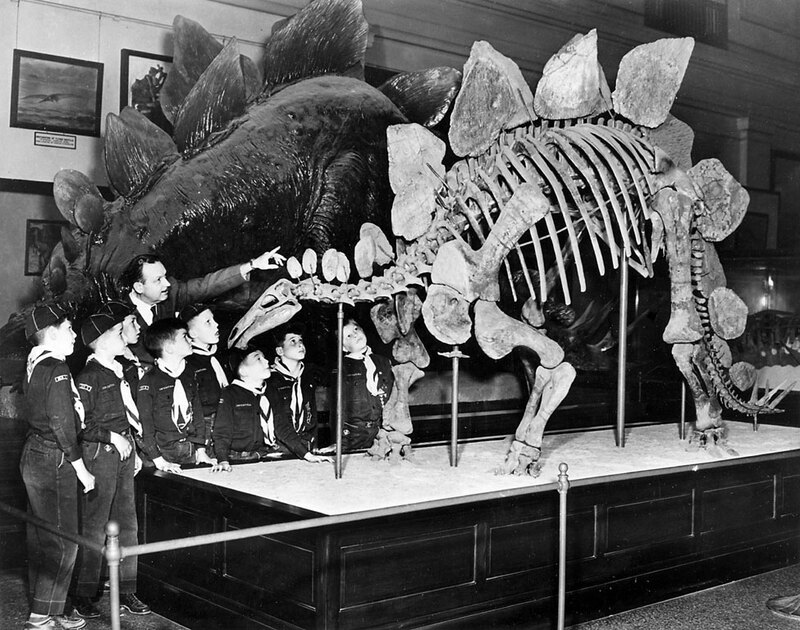 High school teacher Frank Kessler discovered the Stegosaurus (DMNH 1483) in 1937 while leading a nature hike north of Cañon City. 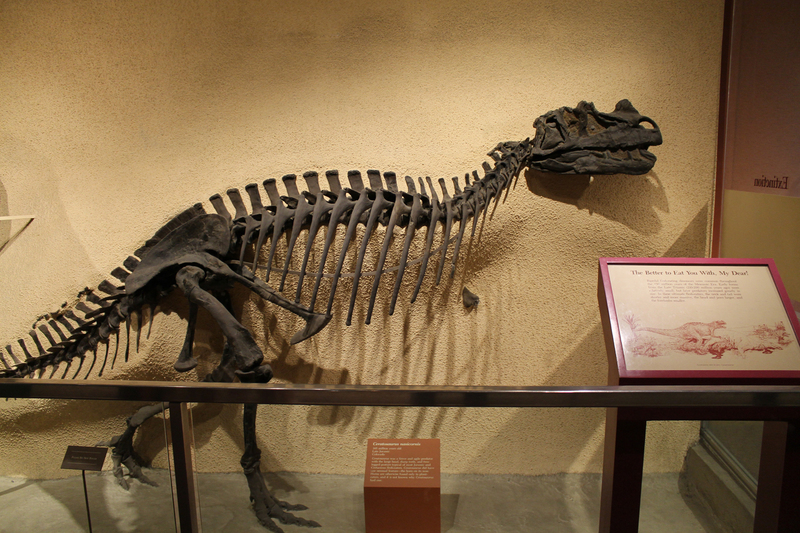 While the Garden Park region had been known for its Jurassic dinosaur fossils since the days of O.C. Marsh and E.D. Cope, Kessler’s find was in a previously unexplored area. Kessler contacted the Denver Museum of Natural History (now the DMNS), and Robert Landberg was dispatched to lead a thorough excavation. Landberg eventually recovered a 70% intact Stegosaurus, in addition to a multitude of turtles, crocodiles, and isolated dinosaur bones. 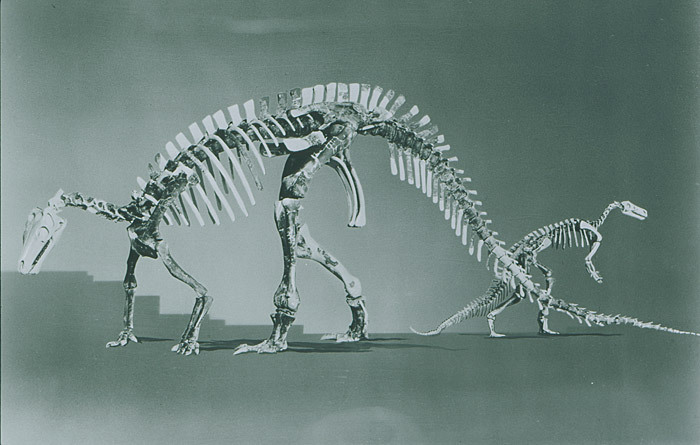 Back in Denver, Phillip Reinheimer assembled the Stegosaurus fossils into a standing mount. A former steelworker from Pittsburgh, Reinheimer was initially hired by the museum to maintain the furnaces, but eventually proved to be an uncommonly talented fossil preparator. Described by Johnson and Stucky as “a master craftsman,” Reinheimer remains something of a legend among preparators to this day. 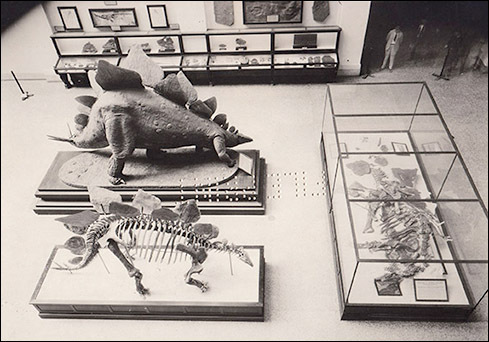 Reinheimer completed the Stegosaurus mount in 1938, and it remained a focal point of the museum’s fossil exhibits for decades afterward. 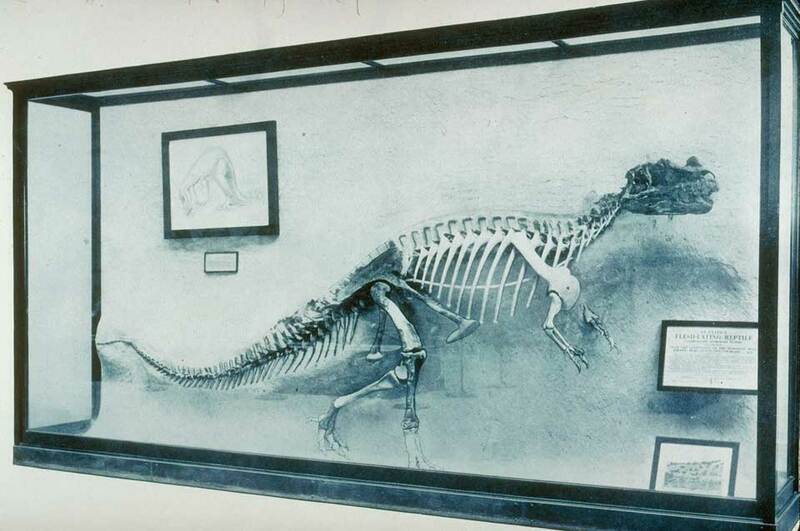 In 1982, this specific specimen was named the state fossil of Colorado. In 1979, 13 year-old India Wood discovered and identified an Allosaurus skeleton on her family’s ranch in Moffat County, Colorado. She excavated the find herself over a period of three years, until her mother encouraged her to reach out to the DMNS. After seeing the fossils Wood had been collecting in a box under her bed, paleontology curator K. Don Lindsay agreed to excavate the rest of the skeleton. The project took two more summers to complete, and Wood remained an active participant. Although many at the museum remember being impressed by her knowledge and talent, Wood ultimately did not pursue paleontology as a career – she instead went on to earn an MBA from MIT and founded a business consulting firm. Meanwhile, Wood’s Allosaurus (DMNH 2149) remained in storage for more than a decade – until it was selected to feature in an ambitious new exhibit. 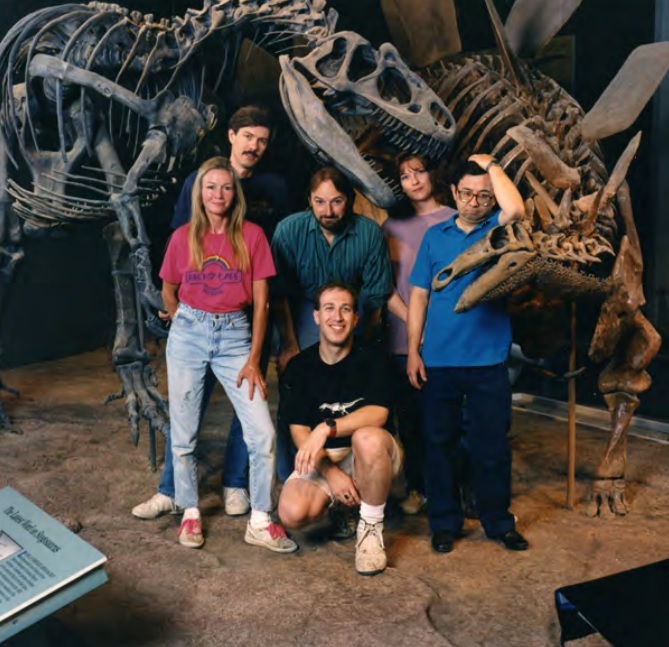 From left to right: Wood’s Allosaurus, Karen Alf, Bryan Small, Jon Christians, Jerry Harris, Jennifer Moerman, Ken Carpenter, and Kessler’s Stegosaurus. Image from Johnson and Stucky 2013. The DMNS had been a powerhouse of paleontology research in the early and mid 20th century, but by the 1980s its reputation had slipped away. That changed in 1989 when Richard Stucky came on board as the new Curator of Vertebrate Paleontology. Stucky brought order to the museum’s historic collections, and laid out plans for a comprehensive new exhibit entitled “Prehistoric Journey.” He also hired a new pool of talent to make the project happen, including paleontologist and preparator Ken Carpenter. As Chief Preparator, Carpenter was tasked with moving, restoring, and in some cases remaking the classic Reinheimer mounts, including the Kessler Stegosaurus. The DMNS crew also ventured into the field to collect new material for Prehistoric Journey. Among the most impressive finds was a new Stegosaurus (DMNH 2818), discovered by Bryan Small at Garden Park only a few hundred yards from where the Kessler specimen was unearthed. 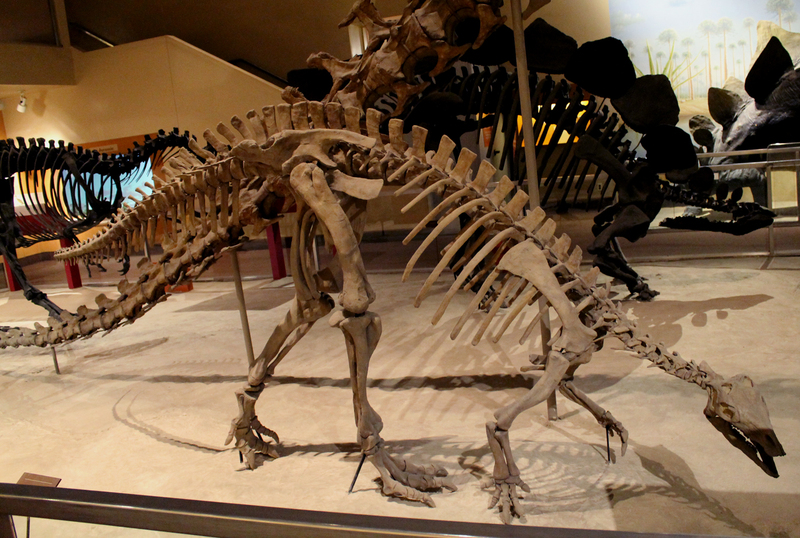 This articulated specimen clarified for the first time the position of the animal’s plates and spikes, and also confirmed that Stegosaurus had throat armor made up of tiny hexagonal ossicles. All of this informed the remounting of the Kessler Stegosaurus. Carpenter’s take on this classic specimen paired it with India Wood’s Allosaurus, right in the middle of the Prehistoric Journey dinosaur gallery. The Stegosaurus is shown defending two (largely reconstructed) juveniles from the attacking theropod, while five or six Othnielia (casts) flee the scene. Twenty years after its 1995 debut, this scene is still among the most impressive fossil mounts around because of the seemingly effortless way it captures action and behavior. Carpenter and his colleagues did not only restore the shape of these animals but breathed life into them. The viewer cannot help but imagine the events that preceded this encounter, as well as the eventual outcome. The suspended bones are like brush strokes in an impressionist painting, swooping through the space and imbuing it with energy and motion. The fact that these are mostly original fossils rather than lightweight casts makes the display all the more impressive. I’ve said it many times before, but it bears repeating that fossil mounts are fascinating, challenging objects in that they are both authentic specimens and interpretive creations. In many cases these conflicting identities are jarring. However, with the right amounts of artistry, aptitude, and solid science, a fossil mount can transcend this juxtaposition and serve each identity equally well. 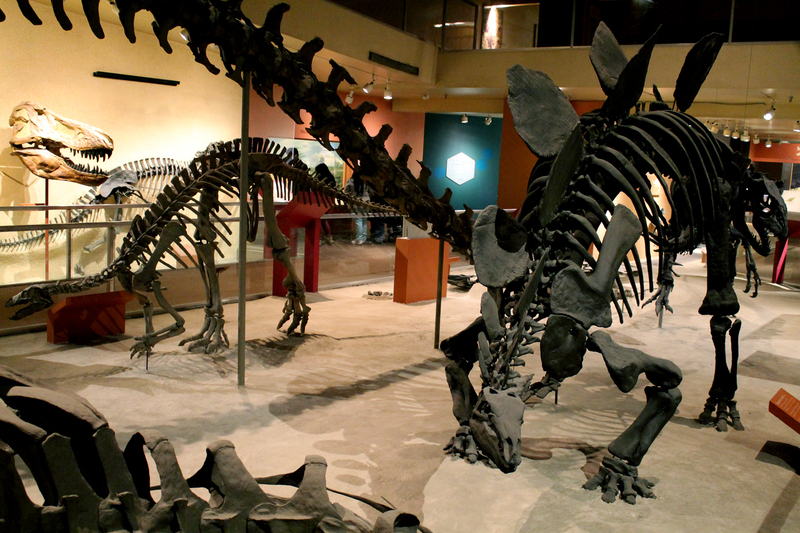 Not an easy feat, but the DMNS Stegosaurus and Allosaurus are a defining example of the craft. Carpenter, K. (1998). Armor of Stegosaurus stenops and the Taphonomic History of a New Specimen from Garden Park, Colorado. Modern Geology Vol. 22: pp. 127-144. Johnson, K.R. and Stucky, R.K. (1995). Prehistoric Journey: A History of Life on Earth. Golden, CO: Fulcrum Publishing. Johnson, K.R. and Stucky, R.K. (2013). Paleontology: Discovering the Ancient History of the American West. Denver Museum of Nature and Science Annals No. 4: pp. 231-282.. Instead of repeating last year’s navel-gazing, I’m going to try something a little more interesting with my obligatory year-in-review*. This post will recap 2014’s big events in museum paleontology – I’ve covered some of it before, but there’s plenty that I missed as well. 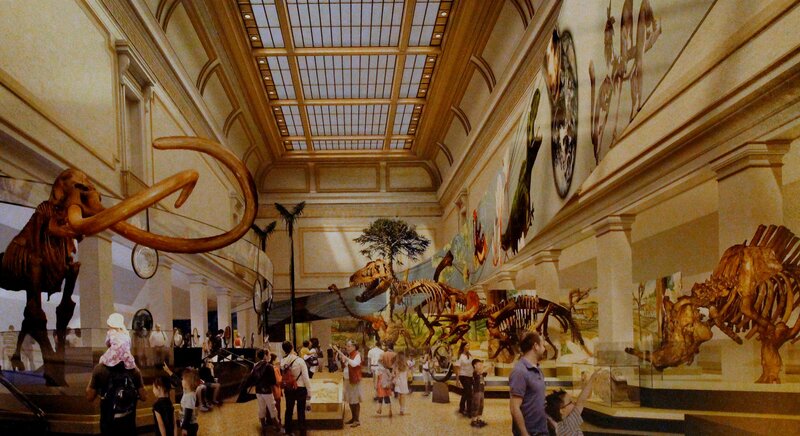 Concept art for the new NMNH fossil hall, opening 2019. I don’t think it’s a stretch to say that the most important event in the world of fossil exhibits this year was the closing of the National Museum of Natural History’s east wing. This is the world’s most-visited natural history museum, and the fossil mounts on display here have been among the most widely-viewed anywhere. The east wing has been home to paleontology displays since the building opened more than a century ago, but until now it has never undergone a complete, wall-to-wall modernization. Since the halls closed in April, NMNH staff have made significant progress de-installing the old displays, including some mounted skeletons that have been on display for over 80 years. Over the next five years, this historic space will be restored to it’s original neo-classical glory, and eventually remade into a new chronicle of the history of life on Earth suitable for the 21st century. NMNH was among the last of the classic American natural history museums to commit to a post-dinosaur renaissance overhaul (the American Museum of Natural History started the trend in 1995, followed by the Field Museum and the Carnegie Museum). All eyes are now on the Peabody Museum of Natural History, where the great hall of fossil reptiles still looks much as it did sixty years ago. A plan is in place for a $30 million renovation, and the museum is currently soliciting donations to fund the project. For now, however, New Haven is one of the last places in North America where visitors can still see early-20th century dinosaur mounts. Spinosaurus at the National Geographic Explorer’s Hall. Photo by the author. 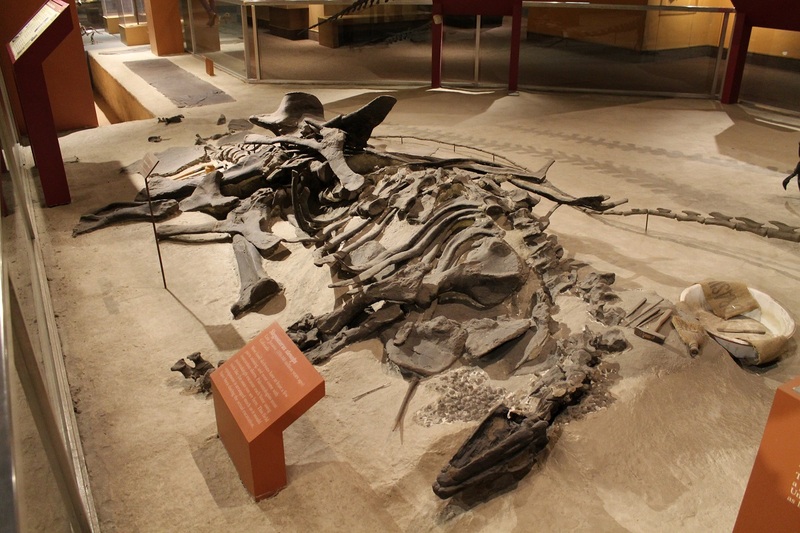 Several new temporary and traveling fossil exhibits opened in the United States this year. The biggest splash was made by “Spinosaurus: Lost Giant of the Cretaceous”, which I reviewed in September. Premiering at the National Geographic Explorer’s Hall in Washington DC, this exhibit is science outreach on a grand scale. It debuted alongside a technical paper by Nizar Ibrahim and colleagues that redescribed the well-known Spinosaurus as a short-legged analogue to early whales. While there has been some skepticism about the paper’s conclusions, credit must be given for such an ambitious public display of up-to-the-minute research. 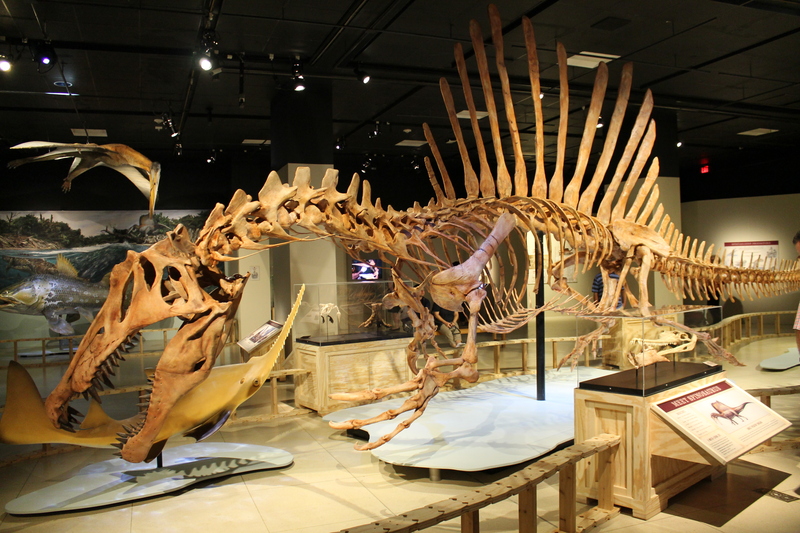 The exhibit, which includes a 50-foot reconstruction of a swimming Spinosaurus skeleton, will be on display in Washington through April 12. After that, it begins its world tour in Germany. Washington, DC got a second new paleontology exhibit this Fall in the form of “The Last American Dinosaurs” at NMNH. Focusing on the North American ecosystem that existed just before the Cretaceous-Paleogene extinction event, this exhibit will serve as an interim dinosaur attraction while the main fossil hall is being renovated. The Last American Dinosaurs is more than a stopgap, however – it’s a remarkably well-crafted look at ecology and the phenomenon of extinction, both in the past and in the present. Other 2014 fossil exhibits of note include “Tiny Titans: Dinosaur Eggs and Babies” at the Peabody Museum, and “Pterosaurs: Flight in the Age of Dinosaurs” at AMNH. Tiny Titans didn’t feature any show-stopping fossil mounts, but it was nevertheless a charming, kid-friendly exhibit focused on how different groups of dinosaurs raised their young. I thoroughly enjoyed it, particularly the gorgeous artwork by Luis Rey. I missed my chance to check out Pterosaurs (it closes this week), so if you were able to see it please share your thoughts! 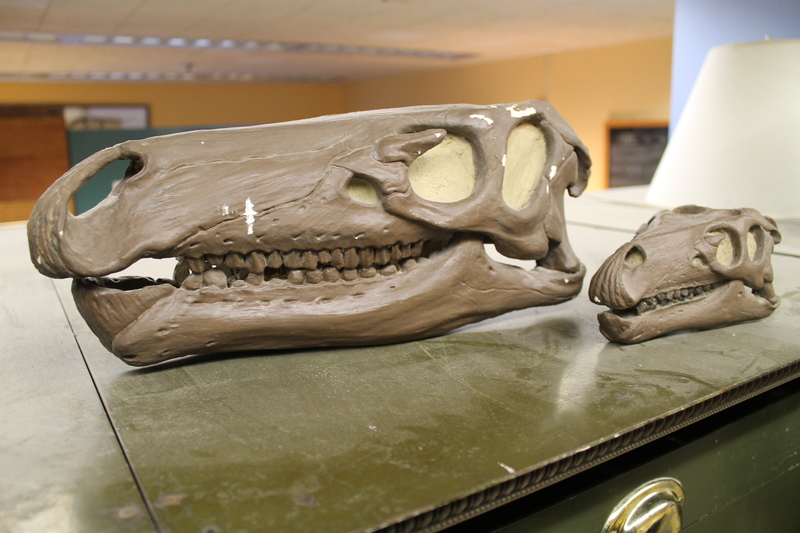 What was the coolest mounted fossil skeleton created this year? For the runner up, I’d pick the aforementioned Spinosaurus. Created by RCI and Acme Design under the direction of Paul Sereno’s lab at the University of Chicago, this replica skeleton embodies both the possibilities and pitfalls of digital technology. The Spinosaurus mount is based on a digital composite of laser-scanned fossils held in at least three countries, as well as scaled-up bones from related animals like Suchomimus, and a fair amount of sculpted material. On one hand, it’s incredible that a unified vision of this animal can be willed into three-dimensional existence. However, one could reasonably voice concern about presenting a somewhat controversial hypothesis in a format that implies authenticity. Virtually all fossil mounts are composites to some degree, but it seems we’re still working out the limits of how far this concept can be taken. In contrast, I have no reservations in granting Mount of the Year to Sophie the Stegosaurus. 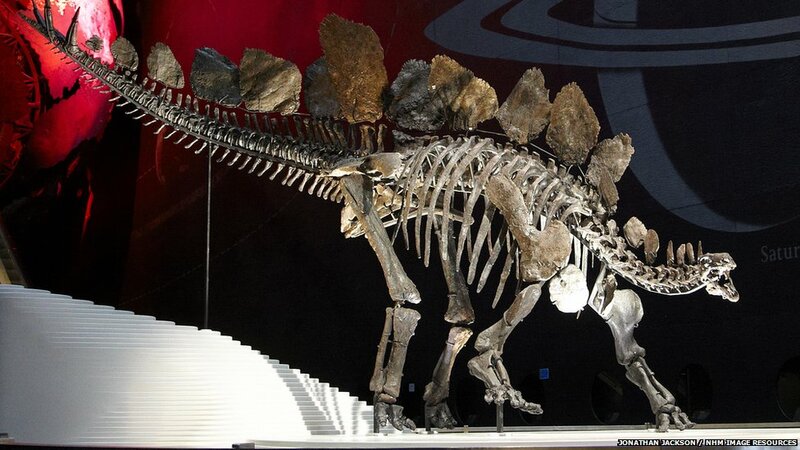 Unveiled on December 4th at London’s Natural History Museum, this is the most complete Stegosaurus specimen known and the first example of this species to be displayed in Europe. It’s also the first new dinosaur skeleton to be added to historic NHM exhibit halls in more than a century. After the museum purchased the skeleton from a private dealer in 2013, Paul Barrett and Charlotte Brassey have been carefully examining (and laser-scanning) every inch of it for the better part of the last year. New data on the biomechanics and behavior of Stegosaurus is due out soon, but for now the public can enjoy the 18-foot skeleton in a dramatic display at the museum. In addition to the impressive work creating a dynamic pose with nearly invisible supports, I’m particularly taken by NHM’s outreach efforts, which explain the importance of this skeleton for a broad range of audiences. 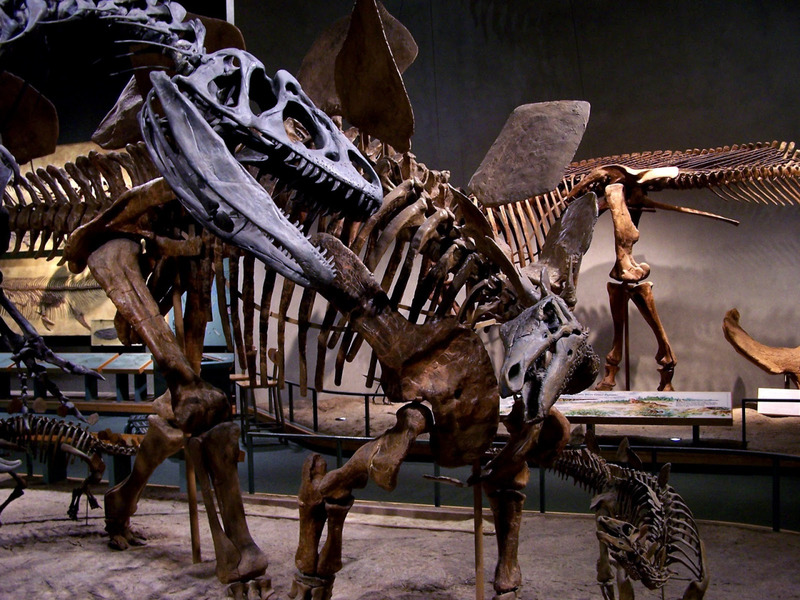 All in all, 2014 was a pretty good year for paleontology on display. While fossil exhibits remained stagnant for much of the 20th century, the last decade plus has seen an explosion of displays to feed the public’s insatiable appetite for dinosaurs. Perhaps in the future we will call this time the second golden age of fossil mounts! *For the record, Dinosours! got about 26,000 visitors last year, many of which I owe to the good people at Love in the Time of Chasmosaurs and SV-POW. My review of the Spinosaurus exhibit was by far the most popular post, followed by the two-parter on Triceratops posture and the true story of the mismatched “Brontosaurus” skull.